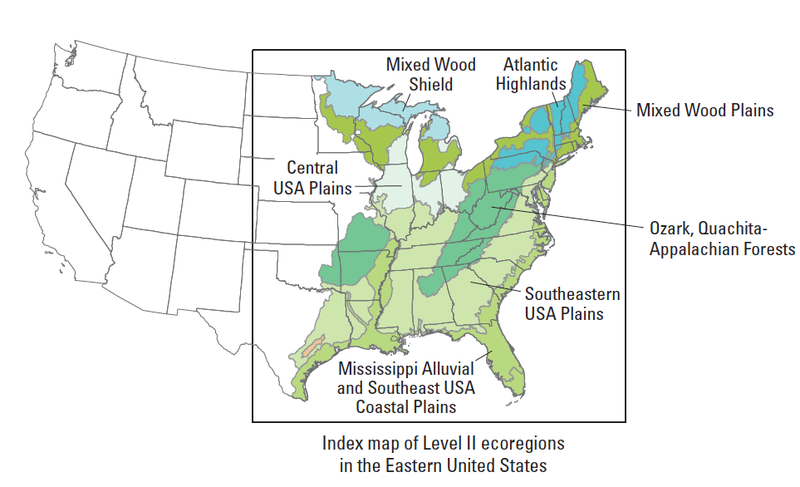 Map showing the portion of the U.S. that was assessed in the latest USGS carbon report. Jun 26, 2014 • The U.S. Geological Survey released a report this week assessing terrestrial and aquatic greenhouse gas fluxes for the Eastern U.S., specifically focusing on carbon dioxide, methane, and nitrous oxide. An area of 3.05 million square kilometers east of the Mississippi was assessed. Carbon stocks in the Eastern U.S. are mainly found in forests (~68%), wetlands (~15%) and agricultural lands (~15%), with open water, grass- and shrublands, and other land types making up the rest. The researchers found that between 2001 and 2005, the Eastern U.S. was a carbon sink, taking up nearly 280 teragrams of carbon per year. Projections were also made about future carbon fluxes between now and 2050. The report relied on satellite remote sensing data and ground-based measurements. Landsat data played a key role in the carbon estimates. To begin, the researchers used the Landsat-derived National Land Cover Database (NLCD) to look at land cover changes between 2001 and 2005. The NLCD allowed them to define the spatial boundaries between the major ecosystems they were analyzing. To have a clear understanding of timber clearcutting and wildfire dynamics during the study period, they once again relied on Landsat-derived products to quantify year-to-year changes. Once the researchers mapped the changing boundaries of major ecosystems and the land cover dynamics of highly variable clearcutting and wildfires, they could use ground-based measurements and statistics to calculate carbon storage.